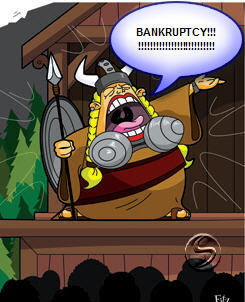 My day job is bankruptcy paralegal. Let me say upfront that I don't give legal advice but I can point you in the right direction. I've been working for bankruptcy lawyers since 1993 (oy), particularly in large chapter 11 corporate cases. I've seen debtors come and go. It happens. Chapter 11 of the United States Code was created by Congress to give people and/or businesses a chance to straighten out their debts, i.e. staying the old debt, getting new loans, getting rid of dead contracts, assuming good contracts, selling stuff or not, reorganizing with a plan to pay back creditors, etc. However, in December, when OperaChic reported that the Baltimore Opera filed bankruptcy, it felt close to home. Its no secret that I love the arts and entertainment, so this hurt. I've never been to the Baltimore Opera, although many of my friends have. Also, it affects singers and all of the people who work to get the singing done in front of the stage and backstage. Now, the Baltimore Opera is STILL in business. Chapter 11 doesn't halt business, it just stops things until the company can reorganize. The Baltimore Opera does plan to return to producing live opera. In the meantime, they have cancelled their productions of The Barber of Seville and Porgy and Bess scheduled for March and May, 2009. On December 23rd, the Baltimore Symphony Orchestra, Washington National Opera, Centerstage and the Hippodrome came to the rescue of patrons of these productions, at least, when they announced that they would offer a gift of free tickets by sending out vouchers to Baltimore Opera subscribers and ticket holders. That totally rocks and is so rare. I've been watching this drama unfold via PACER. Bankruptcy filings are public documents. Among the papers that a debtor is required to file are the Schedules. This is a list of all of their assets and liabilities. Regarding the Baltimore Opera, I was particularly interested in seeing who their creditors are. No surprises really - a secured loan for land and property, state taxes, a union or two, various administrative items like health insurance, pension, newspapers, phone service, etc. The other critical part of the Schedules is the listing of executory contracts and unexpired leases. You guessed it - these executory contracts are the singer contracts, among others. In addition to contracts for The Barber of Seville and Porgy and Bess, Baltimore Opera also held contracts for Cyrano, Rigoletto and The Magic Flute. Perhaps, Baltimore Opera will get its act together in time to stage these three after May. If not, it owes as much as $40,000 to Elizabeth Futral for the role of Gilda in Rigoletto, not to mention $100,000s of more to lesser known (to me, at least) singers plus the conductors, orchestra, and chorus members. I'll be watching for Baltimore Opera's Plan of Reorganization to see what they are planning to do next. In the meantime, if you are owed money for debt owed to you by the Baltimore Opera prior to their filing on December 4, 2008, you can file a Proof of Claim with the Bankruptcy Court for the District of Maryland, Baltimore Division. The case number is 08−26265. The due date for filing a claim, a/k/a the Bar Date, is April 7, 2009. You're such a smart cookie :), and using your powers for good. Aw, my poor Baltimore! The only opera I have ever seen was at the Lyric (Cinderella as I recall, I was only 7 or so). But I'm really thankful and not surprised that the other theaters are pitching in. Baltimore has a really tight knit art community. Thanks for that great post! We musicians need more business support and I'm glad you are out there! Please keep us posted on the goings of Baltimore Opera. I heard about the Spa claim from a friend who said that after the Baltimore Sun reported it, they published a correction/apology. I think he said that the C.T.C. SPA was building their sets or something legit like that. I couldn't find anything on line to support it but thought you would like to know. how fascinating! Thanks so much for digging! As for the 'spa'- S.p.A. is the Italian equivalent of 'Inc' in an American company name. It's an abbreviation for Società per Azioni, a type of joint stock company. There are several Italian companies called (or rather, abbreviated as) C.T.C. S.p.A. One has a website here: http://www.ctcspa.com. They make elevating platforms. Do you have a link for the Chapter 11 documents? I'd love to read more. Terrific to know what C.T.C. does. It's expecially terrific to know it's not a frivolous expense. Anybody can obtain the documents via PACER. You just need to get a login/password. It's very inexpensive at 8 cents per page. The link is w/in the post. What is the real story behind the bankruptcy of the Baltimore Opera Company? Airlines go into bankruptcy and continue to operate. Why couldn't the Opera? Why didn’t management and the board of directors have better control of the finances of the Baltimore Opera? Was there an endowment fund which could have been tapped? What percentage of available tickets were sold for this season’s two performances? Why was there no appeal for contributions from season subscribers and the public prior to the bankruptcy filing? The company announced that it plans to undergo an administrative re-organization and return grand opera to the stage. Since there were no refunds for tickets for the balance of the season, how can they expect to sell tickets for anything unless advance ticket revenue is placed in an escrow account? Dear Charles Myers, Unfortunately, I don't know the answer to your questions. I suspect, based on what I know about big corporate bankruptcy cases like the airlines, etc, that they didn't continue to operarate because they did not get debtor in posession financing. That could still happen. The US Trustee just appointed an Unsecured Creditors Committee on February 6th: 1. American Guild of Musical Artists attn Eleni Kallis, Mid-Atlantic Area Rep; 2. Lyric Foundation, LLC attn Sandy Richmond; 3. Lyric Productions, LLC attn Sandy Richmond; 4. DCM, Inc. attn Matt Svigals, Director of Operations; and 5. Diversified Printing attn James MacFarlane. This committee will help push decisions on behalf of all the unsecured creditors. Meanwhile, a plan and disclosure statement have still not been filed. I will keep watching for these, because they will give us some indication of what the Baltimore Opera plans to do. Three months after seeking Chapter 11 bankruptcy protection and canceling the remainder of the 2008-2009 season, the board of trustees of the Baltimore Opera Company voted yesterday to pursue Chapter 7 liquidation instead and dissolve the 58-year-old organization. The company's assets, including a warehouse, scenery, costumes and technical equipment, will be sold, and the proceeds will be distributed among creditors. "We had some promises of money, but there just wasn't enough out there," said general manager M. Kevin Wixted. "To raise money for a season of opera was out of the question. We could have struggled on month to month, but we'd never get ahead. I know people wanted to believe we'd come back. But in this business, you have to depend on raising big money from people." Added board chairman Allan Jensen: "Maybe part of the problem was that we tried to put on world-class productions in a town that wasn't ready to pay for them. Ticket sales take care of only a small part of the costs." Baltimore Opera, like many arts organizations, experienced a steep drop in income from tickets and contributions last fall as the national economy soured. Cash flow reached such a critical state that a board member had to personally guarantee cast salaries for what turned out to be the company's final production in November at the Lyric Opera House. "We've lost many of our corporate contributors that used to be headquartered here. And we had no endowment," Jensen said. "The final nail in the coffin was the recession." The company filed for Chapter 11 protection Dec. 9. Wixted said it could take 60 days or more for the Chapter 7 filing to get through the courts for a trustee to be appointed to oversee the liquidation. "It's been a rough three months," Jensen said. "Obviously, we're disappointed. There were moist eyes at the board meeting, as you can imagine. I hope that a phoenix will arise from the ashes. My presumption is that, when economic times get better, a handful of people will get together to create a new opera company. There have been rumors that Washington National Opera would bring some of their productions to the Lyric." Mark Weinstein, executive director of Washington National Opera, had no comment about those rumors. He called the news of the liquidation "just unbelievable. It's extraordinarily sad for all of us in the opera industry. The company had a great history. I can't imagine the city of Baltimore not having a major opera company. Washington National Opera stands ready to assist in any way we can." Wayne Brown, director of music and opera for the National Endowment for the Arts, likened the loss of the company to "a member of your family who is no longer there. It's unfortunate that the Baltimore Opera as we know it may soon be history. It achieved terrific accomplishments." Here is an article on what Pennsylvania is doing to support arts organizations. Too bad that the State of Maryland couldn't help the Baltimore Opera. No telling how well Gov. Edward Rendell sings, but the Pittsburgh Opera was all ears when he presented the company with a $1 million Capital Budget Redevelopment Assistance grant at the Allegheny County Courthouse yesterday." According to the website "the deal," the Baltimore Opera listed assets of $3.8 million and liabilities of $1.4 million in court papers.